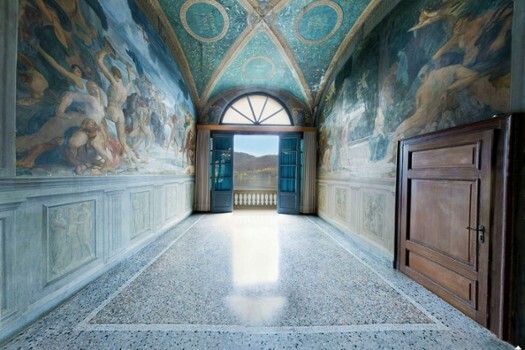 Thanks to Giambattista Sommariva the villa reached its greatest glory in the 18th century, being enriched by art masterpieces and becoming a museum. 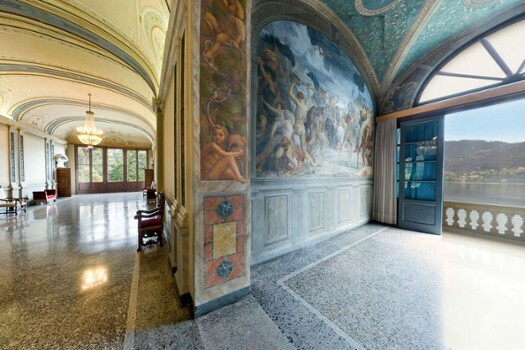 Sommariva was an art collector and bought the estate at the beginning of the century; he enhanced the value of the villa by acquiring Canova's masterpieces such as Palamede, Amore e Psiche, Tersicore, La Maddalena Penitente, but also Thorvaldsen's monumental frieze Alessandro Magno's entrance to Babylon and Hayez famous painting Romeo and Juliet last farewell. 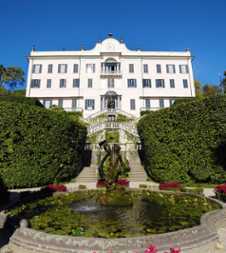 Villa Carlotta is a unique sanctuary of art and beauty with its magnificent botanical specimens and art masterpieces in over 70,000 square meters of gardens and museum. It is located on the most picturesque part of Lake Como and renown for its spectacular gardens which are visited by almost 200,000 people each year. In the mid 18th century Princess Marianne of the Netherlands bought the estate as a wedding present for her daughter Carlotta when she married George II, duke of Sachsen Meiningen. On the second floor of the villa you can still admire furniture, objects, pictures and decorations from that period. 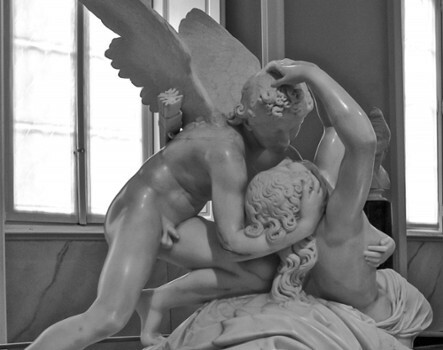 Palamedes is one of the most famous masterpieces of Antonio Canova. Palamedes, king Nauplio's son, inventor of chess and dice games and of some letters of the Greek alphabet, was able to discover the false madness of Ulysses, obliging him to leave his island, Itaca, and go fighting in the Troy war. Ulysses never forgave him and had his revenge by making Palamedes condemned to death with false accusations. In this subject - the cultivated and betrayed hero - Sommariva, after losing his political power, recognized part of his personal history. 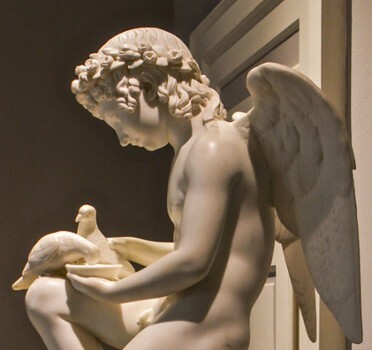 He commissioned this sculpture to Canova, but in 1805, when it was still in the Canova's atelier in Rome, the statue felt down, because of a flood of the Tevere River, and broke in many pieces. 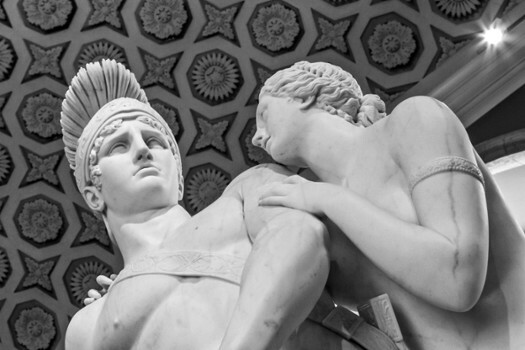 Canova personally restored it, between 1806 and 1808. 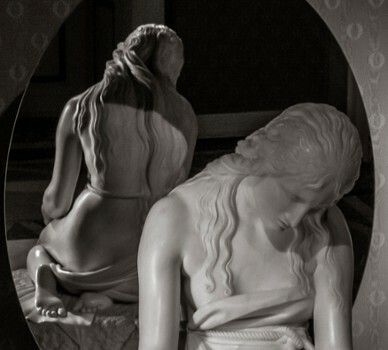 The sculpture arrived in Tremezzo in 1819; in the villa, it was located in a room with mirrors on the walls in order to show up its formal perfection. The Muse Terpsichore by Antonio Canova (1757-1822) is the precious original plaster model made for the marble sculpture representing the muse of dance commissioned by Sommariva in 1811. Born as a portrait of Alexandrina Bleschamps, wife of Napoleon's brother, Lucien Bonaparte, the sculpture acquired a more idealized physiognomy following Sommariva's will. This plaster is a real masterpiece for the its plastic art, especially in the drapery; it's still nowadays characterized by the 'repère', small nails, very useful instruments in the creative process of Canova's art. With a sketch, the artist developed the idea of a sculpture; thanks to this first idea he realized two models, one in reduced scale, generally in terracotta and after this a bigger model that allowed him to deepen the study of the composition. 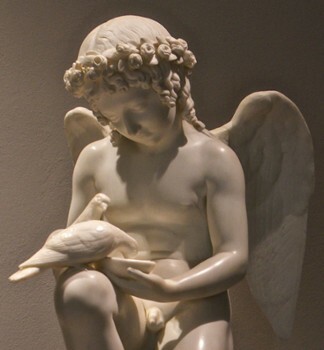 The next step was the realization of a life-size model in clay and after this the definitive model, in plaster; in the key-points of such a model some small nails were hammered in, in order to give to the Canova's scholars the necessary points of reference to copy the sculpture in the marble. The hard work done, Canova finished the sculpture. 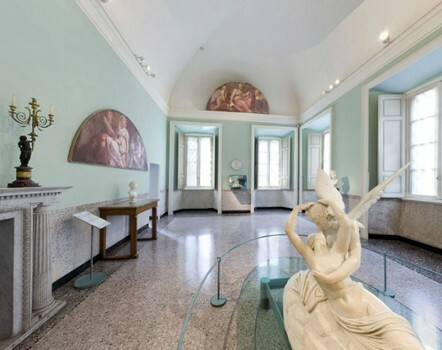 In the centre of the room it's possible to admire the marble group Eros and Psyche reclining by Antonio Tadolini, one of the best Canova's scholars. It's a replica taken from the original model of Antonio Canova of the sculpture commissioned by the Russian prince Yussupoff (today at the Hermitage museum in St. Petersburg). 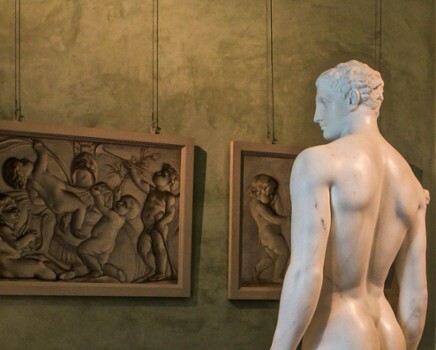 Made from a block of Carrara marble of exceptional beauty, this sculpture arrived in Tremezzo in 1834 where it became a real icon of sensuality and passion. 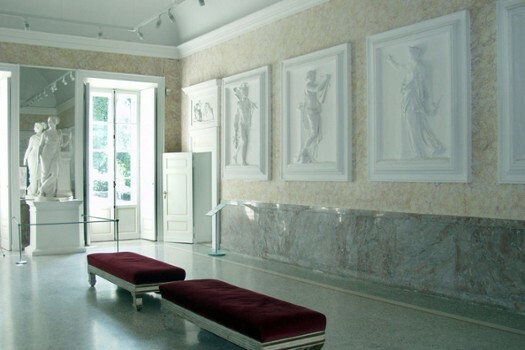 In this room is located an anonymous and coeval replica of the Repentant Magdalene, by Canova. G.B. Sommariva, who was also the owner of the original work (placed in his Parisian Palace) created for the sculpture a specific location: a small cabinet with grey silk tapestry an alabaster lamp to enhance the its delicate sensuality. The last Adieu of Romeo and Juliet, 1823, oil on canvas by Francesco Hayez (1791-1882) is a manifesto of the Italian Romantic painting. Inspired by the famous Shakespearean tragedy, this painting was commissioned by Sommariva in 1823. The scene - in the house of Juliet, the young woman is embracing Romeo for a last kiss in the pink light of dawn - is characterised by an interesting structure and the chromatic expression inspired by the ancient Venetian tradition of coloration. Under a beautiful vault, along the perimeter is located one of the masterpieces of the collection: the high relief with the Entrance of Alexander the Great in Babylonia by the Danish sculptor Bertel Thorvaldsen (1768-1844). This work was brought about in a first version in stucco for the Quirinale Palace in Rome on the occasion of Napoleon's visit. Completed in June 1812, it was so beautiful that Napoleon ordered a marble replica for the Pantheon in Paris. The changed political conditions arrested the very expensive order, till Gian Battista Sommariva decided to relieve it in 1818. 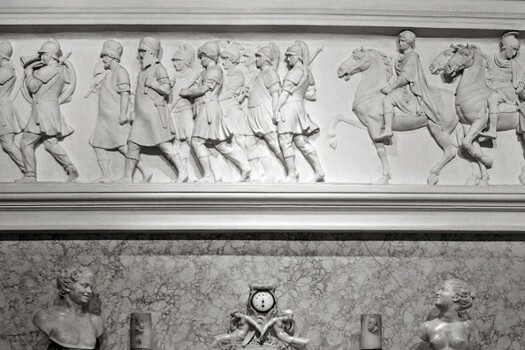 The 33 marble slabs of the frieze arrived in the villa in Tremezzo between 1818 and 1828 composing year after year the scene of the triumphal entering of Alexander the Great and his army in Babylonia. Alexander is on a quadriga, guided by a winged Victory; he is followed by two squires with weapons, the impetuous horse Bucephalus, his cavalry and his infantry, an elephant with the spoils of war and a slave king. The last two character at the end of the frieze are a self portrait of Thorvaldsen and a portrait of Sommariva. On the other side of the frieze Peace is guiding the Babylonia citizens: the satrap Mazzeo with his sons, priests and dancers, soothsayers and musicians, fishermen and shepherds. The large oil painting The reading of the VIth book of the Aeneid by the French painter Jean-Baptiste Wicar (1762-1834) shows a scene 23 b.C., Rome: in front of the emperor Augustus, the poet Virgil is reading his poem. Ottavia, Augustus' sister, faints while she's listening to the verses that evoke in her mind the death of her son, Marcello. Augustus stops the reading; Virgil stands to the left; to the right are Maecenas and General Agrippa, portraits of Sommariva and Napoleon. 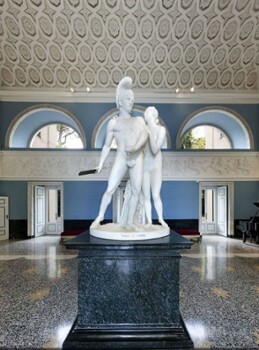 This painting was commissioned in 1818, thanks to Antonio Canova, and before arriving in the villa of Tremezzo was exhibit with great success in Milan in 1821. The apotheosis of Napoleon the Emperor is the subject of the frescoes of Andrea Appiani (1754-1817) hanging from the ceiling and the wall: they are the sole evidence - survived the bombing of 1943 - of the large decorative cycle done by Appiani for the Royal Palace in Milan in 1808. In the great octagonal medallion, Napoleon is portrayed on an imposing throne, supported by four winged victories and surrounded by the Zodiac and the Hours. In the four lunettes are represented the cardinal virtues: Prudence with mirror, sand-glass and sphinx, Justice with sceptre and Law code, Fortitude with lion, shield and club and Temperance with a winged genius mixing water and wine. In this room is also located a precious neoclassical chest of drawers in inlaid walnut, varnished and gilded, produced around 1776 by Giuseppe Maria Bonzanigo (1744-1870), based on the drawing by Piacenza and Rondoni and originally in the Royal Palace in Milan. A rare collection of plaster cameos, more than 470 pieces, created by the Roman artist Giovanni Liberotti. It's a very important collection still preserved in its original wooden boxes: the quantity, the exceptional state of conservation, the quality of execution of these cameos are surprising. This collection is also very important to understand the history of the villa: in fact, it's a reproduction in a very small size of the masterpieces in the most important museums in the XIX Century: Rome, Florence, Naples, Paris and... Tremezzo with villa Sommariva, today villa Carlotta, at those time one of the most well-known collection of art in Italy. Entrance closes 1 hour before closing time. Last ticket 1.5 hours before closing time. Nearby Things to Do include: Hikes & Walks such as Greenway del Lago di Como and Hike to San Martino; Villas such as Villa Carlotta and Villa Meier; Towns such as Cadenabbia and Griante; Churches such as Black Madonna and The Church Of The Ascension; Parks & Gardens such as Villa Carlotta Gardens and Parco Mayer Beach; Water Taxis & Boat Tours such as AvioCars Exotic Boat Tour and Navigazione Laghi (Public Boat Transportation).